DESCRIPTION: March 27, 2006. Boston, MA. Thousands of immigrants and supporters rallied and marched in downtown Boston to protest restrictive new immigration policies being debated in Congress and to call for fair immigration reform. 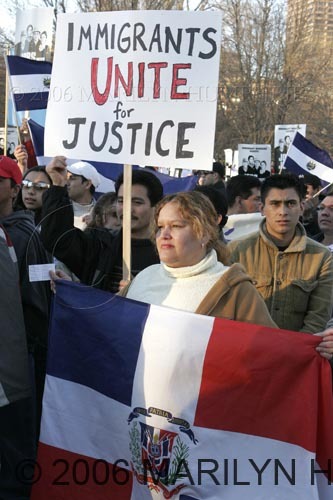 Boston events were organized by the Massachusetts Chapter of the National Alliance of Latin American and Caribbean Communities (NALACC) and by the Massachusetts Immigrant and Refugee Advocacy Coalition (MIRA), along with several community based organizations across Massachusetts.